Hey guys! First off, I just wanted to say that I hope that everyone is having a safe and fun summer! Anyways, I know that it’s been forever since I’ve done a MM, but lately I’ve been uninspired and lazy. Luckily, I saw this video by RealAsianBeauty on Youtube. Prior to this video, she posted one with salt, which basically gives the same effect, but I like the sugar one more. If you follow me on instagram, you saw these nails earlier today, but unfortunately, I had some malware problems,that have been resolved, that were preventing me from updating my blog. Paint each finger with 1-2 coats of each colored polish. I personally did two coats each, but it’s not necessary. It might be better if you only applied one coat because it’ll prevent the polish from getting thick like mine did. Next, paint your first finger with a generous amount of top coat. You want a pretty decent coat because this is going to be your “glue”. 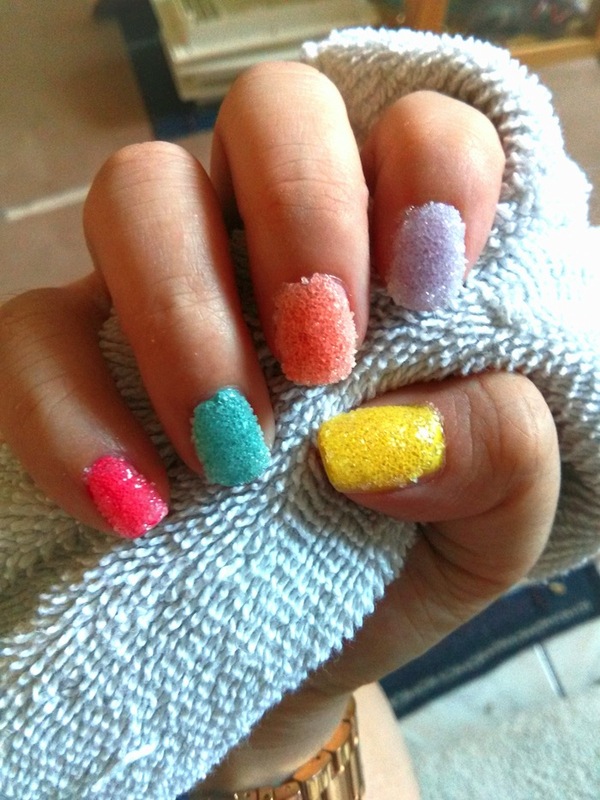 After applying the top coat, immediately press your nail flat into the sugar. 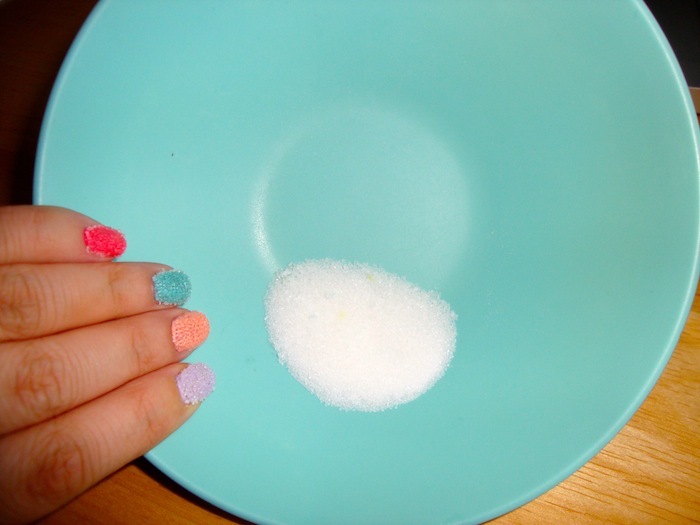 In the video, Kristina says that you can either pour the sugar on or dip your finger in it. I tried both and found that pressing it into the sugar is easier because you get even coverage. Also, try not to go too crazy. I tried to make sure that I covered all of my nail, even the sides, which added extra sugar, and contributed to them being kinda thick. Repeat steps 3 & 4 on all your fingers. Once you have sugar coated all your fingers, apply a coat of matte top coat. I didn’t think one coat sealed in the sugar enough, so I added another. These nails are surprisingly easy to do. There isn’t too much fuss or mess. Obviously, you can’t expect them to last that long, sugar is landing on my keyboard as I type. I give them two days max. Unfortunately, the sugar will probably come off on your sheets when you sleep and I find that my fingers sometimes get sticky if my hands are wet because despite the top coat, the sugar will still dissolve. All in all, I think these nails are really cute and definitely worth a try if you want to try something different. So, that’s it for this week’s Manicure Monday! I hope you guys enjoyed and I hopefully I’ll have another one up next week! Do you have any easy DIY nail art tricks? Share them below! Aww, thanks! No problem! Thanks for visiting my blog! !